Every time a change is made to a language or a string in a language pack, the change is date stamped and saved. This means that you can view the history of changes made to each specific string in an LPX or XAP file. Open the LPX or XAP file in the Language Tool. Select the language you want view. Navigate to the string that you want to view or revert. The list of changes appears to the right of each string. To restore a previous variation of a string, type it into the left column and save the file. It is also possible to remove a language from a language pack, if you no longer plan to support it, or if it is added in error. 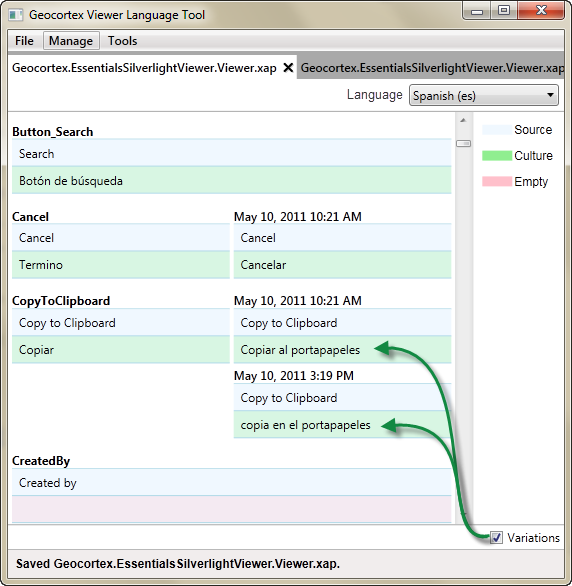 With the LPX or XAP file open in the Geocortex Language Tool, from the Language drop-down list, select the language you want to remove. In the toolbar, click Manage | Remove language. The language is completely removed from the language pack. All the translated strings for a language are deleted when you remove a language. This cannot be reversed.